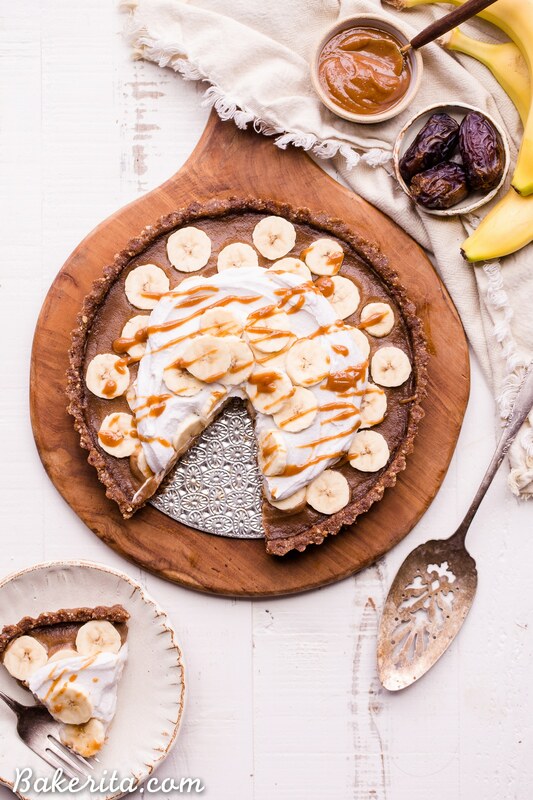 This No Bake Banana Caramel Tart is similar to a classic Banoffee pie, but there’s no baking necessary and it’s sweetened entirely with dates! This healthy twist on a classic is sweet and scrumptious with a date caramel filling and coconut whipped cream on top. It’s gluten-free, paleo, and vegan. If you follow me on Instagram, you might’ve helped me with the STRUGGLE that the coconut cream on top of this tart created. I haven’t had the best luck with whipping coconut cream…and based on a lot of the responses I got from you guys, NEITHER HAVE YOU! It’s a toughie, but I’ve learned some things and you know I’m happy to share, even though I’m not going to lie – it still isn’t foolproof, and there’s still “dud cans” of coconut milk and coconut cream here to mess everything up for us. So, the first batch of coconut cream for the top of this guy totally curdled. Like, looked gross and weird – I later learned from some of my followers that apparently overwhipping can do that. Oops. BUT what’s in the coconut milk can also affect it. Some claim that the coconut creams with gums in them help things get and stay creamy (but the one that split on me had guar gum in it), and some swear that the way to go is ones with just coconut and water as ingredients. This post from Oh Lady Cakes! has lots of good info to help us out, so I’m sending ya over there for some of her tips – she did WAY more testing than me and I’m going to be referencing her faves for the future. Let’s talk about the goodness hiding under that coconut cream though, shall we?! Starting with the super simple date and pecan crust. The pecans are toasted and guys, it’s a game changer. The roasted pecan flavor in the crust takes this tart from good to GREAT. The pecans, along with some dates, almond flour, and coconut oil, make a simple but DELICIOUS crust. You’re going to love it. Now in that crust, we’ve got an absolutely luscious date caramel. Dates are pureed until smooth with some hot water and coconut oil (which helps make things extra creamy and helps it not to be so sticky & firm up a bit once chilled). Add a little vanilla and sea salt for flavor and we’re golden (literally, the stuff is like liquid G O L D). 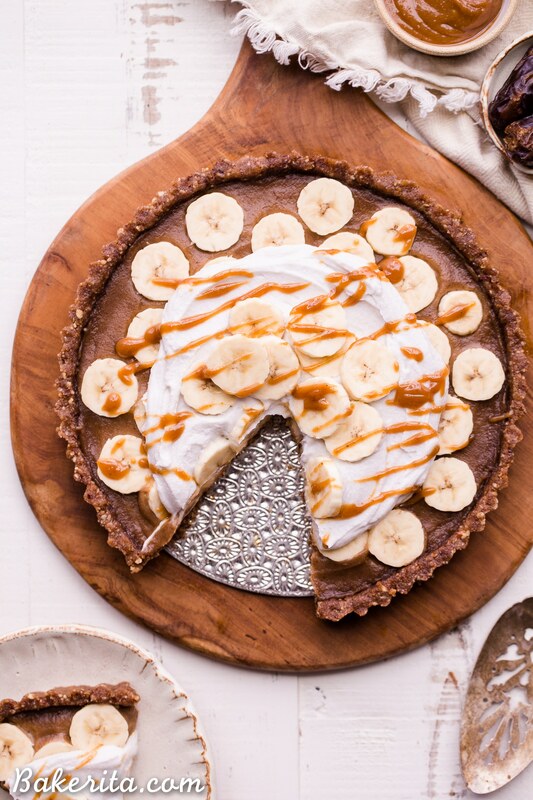 A sliced banana is arranged on top of the date caramel, and then some of that fluffy coconut cream, MORE banana slices, and a caramel drizzle. Oh HECK YA. Layers upon luscious layers. And although this tart looks like it takes a while to make, each of the steps is so quick and simple, it really won’t take too long. For the coconut cream you see on top here, it was actually completely not chilled and barely whipped. I grabbed a can of coconut cream from the cupboard, carefully drained off all of the liquid, and just stirred it up a little bit – it ended up being super smooth and creamy, so it turns out that for me at least, the less I do to my coconut cream, the better it turns out. 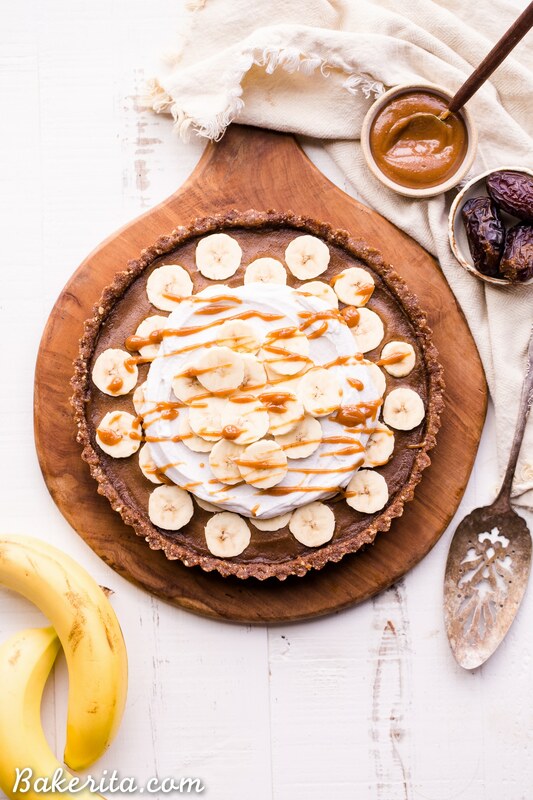 This tart is one that’s best made the day you’re going to serve it, or at least hold off on adding the bananas until you’re ready to serve. Bananas don’t keep particularly well and you don’t want to serve people brown bananas! 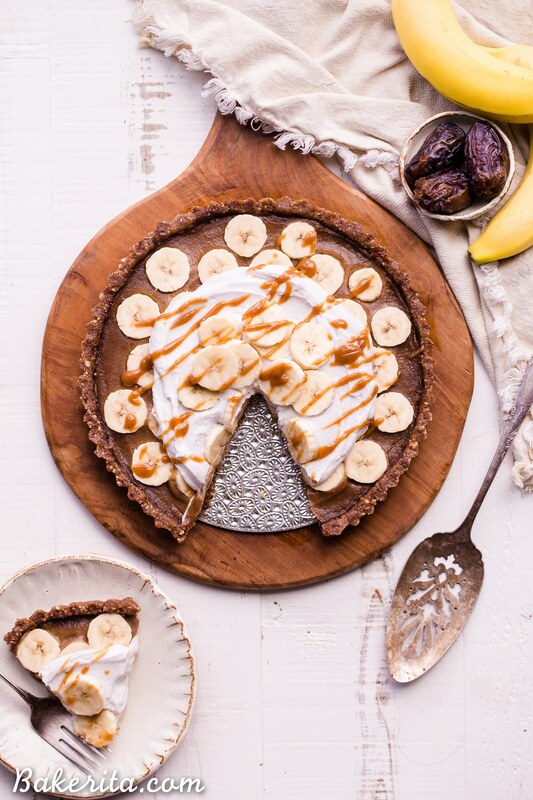 You want to serve them a slice of luscious banana caramel tart, with a smooth and sweet date filling, fresh bananas, and creamy coconut cream. You’d never guess this is sweetened with JUST dates. They’re truly a magical little fruit! I hope you guys love this one as much as I do! :) hope you have the best day, you deserve it my loves! 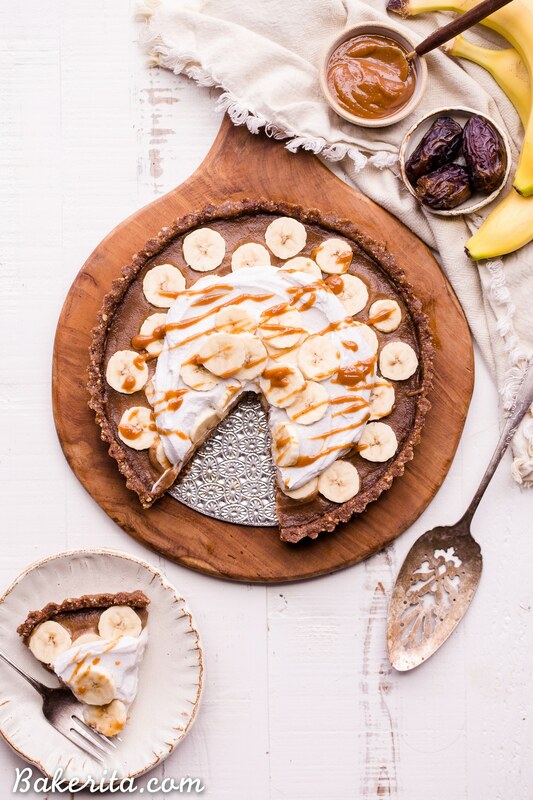 This No Bake Banana Caramel Tart is similar to a classic Banoffee pie, but there's no baking necessary and it's sweetened entirely with dates! This healthy twist on a classic is sweet and scrumptious with a date caramel filling and coconut whipped cream on top. It's gluten-free, paleo, and vegan. Lightly grease a 9" tart pan with coconut oil. Set aside. Add the pecans, almond flour, pitted dates, coconut oil and salt to a food processor or high-powered blender (I used my Vitamix) and pulverize until it comes together into a "dough", with small pecan bits remaining. Press the dough evenly along the bottom and up the sides of the prepared pan. In the same food processor or blender, add the dates, coconut oil, vanilla extract or powder, sea salt, and ⅓ cup hot water. Process until smooth, and then slowly drizzle in the other ⅓ cup water until your desired consistency is reached. Spread the date caramel into the prepared crust. 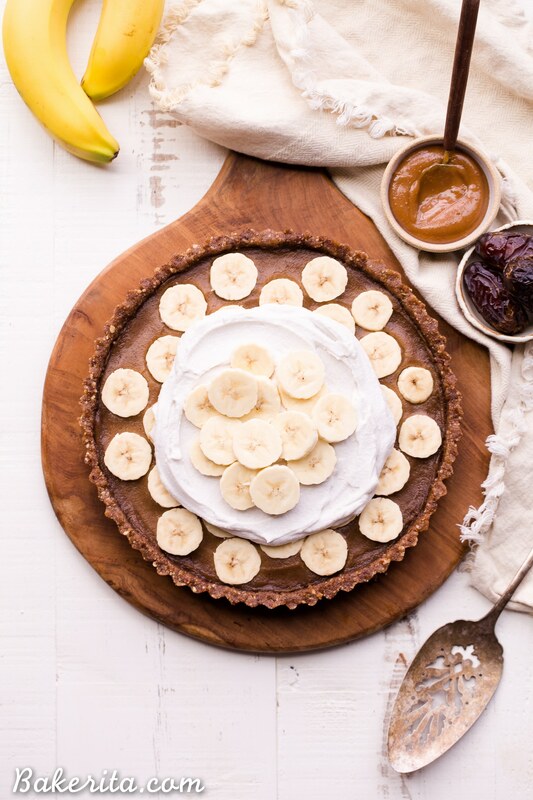 If you’re serving that day, arrange the sliced banana on top of the tart. If not, store tart covered in the refrigerator or freezer until the day you’re serving. When ready to serve, garnish with the sliced bananas. Lightly stir/whisk the coconut cream in a bowl (don’t over mix or it might separate!) and put on top of the tart. Drizzle with caramel sauce (you could also use chocolate if desired). Serve immediately and enjoy! Head to this link for coconut milk/coconut cream tips! Agreed! They’re magical little things :) thanks Brittany!